When you are new to Zaius we recommend sending newsletters to all customers, and then transitioning to sending your newsletters to engaged customers. Start defining a new Segment in the Segment Builder by going to the Segment Manager under the Customers section (Customers > Segment Manager) then clicking the + Segment button. Name the segment: All Customers. Sending your newsletter to an engagement segment can help you maintain your email reputation and customer engagement. For this example we will define engaged customers as those people who have placed an order, visited the website, or interacted with an email in the last 180 days. Name the segment: 180 Day Engaged. Add the filters for the events you want to consider engagements. In this example we are going to view anyone who has had at least on of the following events in the last 180 days as engaged: pageview, email open, email clicked, or order. Build a sentence for Count > 0 for Pageview on or after 180 days before now. Build a sentence for Count > 0 for Email Open on or after 180 days before now. Build a sentence for Count > 0 for Email Click on or after 180 days before now. Build a sentence for Count > 0 for Order Line Item Purchase on or after 180 days before now. Zaius recommends defining a new campaign for each newsletter you send out. This will provide you with insight into the performance of each newsletter individually. Start defining a new Campaign from the Campaigns page (Engage > Campaigns, Create New Campaign). Name the campaign to help identify the newsletter in the future (we recommend placing a date in the name). Tag the campaign as newsletter. 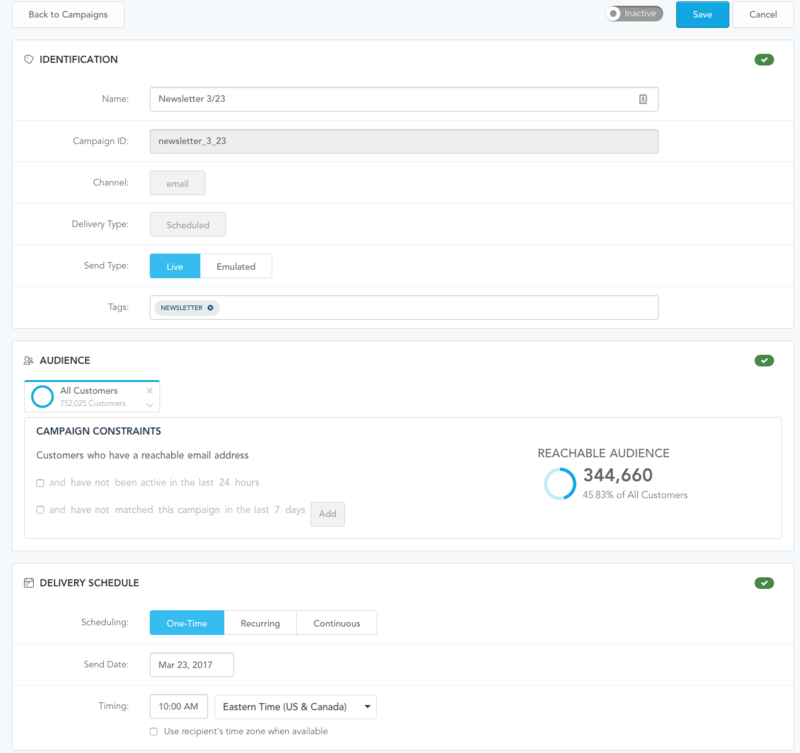 Tagging a campaign allows you to easily view reports across campaigns. Select the desired segment in the Audience section. Set the Delivery Schedule to be a One-Time send on a specific date and time.